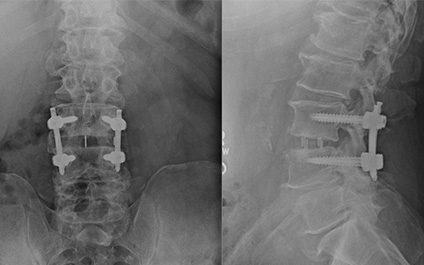 Lateral lumbar interbody fusion (LLIF) is a minimally invasive spine (MIS) fusion procedure used to remove pressure from the pinched nerves, realign and stabilize bones in the lower back. It is known under several different names depending on the manufacturer of the equipment, including LLIF, XLIF, DLIF. As discussed in a separate article, MIS surgery achieves the same goals of traditional “open” surgery while resulting in less damage to body. In general terms, instead of exposing spine from the back, it is approached through a small incision (1-1.5 inches) on the side of the abdomen. Pressure is removed from the nerves by removing the diseased disc and inserting a spacer between the spine bones (vertebrae). The bones are realigned and fused in the appropriate position. In greater detail, the patient is placed under the general anesthesia and positioned on his/her side. After the incision is made, internal organs are reflected away from the surgical area and the side of the spine is approached. In the lower back spine is covered with a large muscle called the psoas muscle, which contains important nerves (lumbar plexus). The fibers of the muscle are spread apart in order to expose the surface of the spine. Special monitoring equipment is used to protect the nerves of lumbar plexus. The muscle fibers are then held out of the way with a special retractor. The diseased disc is removed with a combination of tools, and a spacer filled with a bone graft is inserted. In some cases, the spacer is held in place with a plate and screws. Sometimes placement of additional screws is required through the back. Most steps of this procedure are done using visualization with a small x-ray machine. Most patients with one level surgery spend a night in the hospital, however sometimes a patient may be discharged home the same day. The skin incision is typically closed with absorbable suture, which does not require removal. There are certain limitations in physical activity for twelve weeks, while the bone fusion occurs. These include limiting no bending, no twisting and no lifting heavier than 5 lbs. Pain after this procedure is minimal and only requires weak medications. Anti-inflammatory medications like Advil, Motrin or Aleve may slow down bone healing and are not recommended for the first three months after surgery. What are the benefits of LLIF? Injury to the muscles and blood loss with surgical exposure are minimal. As such, this procedure is tolerated much easier than traditional open surgeries, with less pain and easier recovery. Patients may go home the same day or the following day after surgery, as opposed to two or three nights in the hospital with traditional surgery. Spinal nerves are not exposed during this procedure and as such there is only minimal risk of their injury. 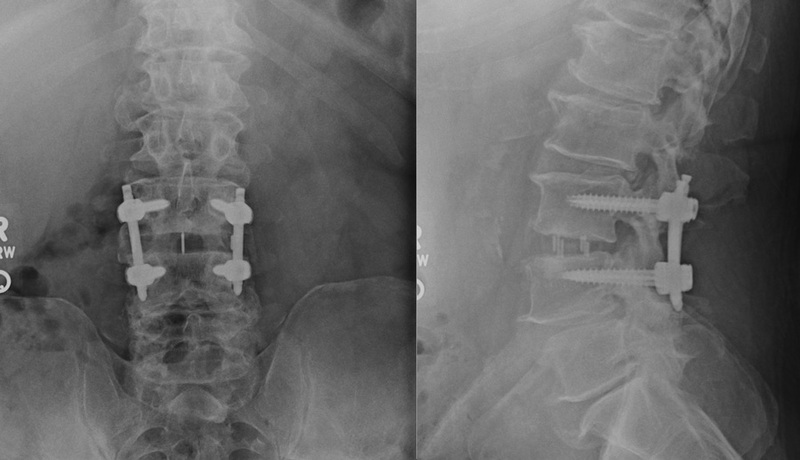 The spine is manipulated from the front, which provides greater mechanical advantage for realignment of the vertebrae. A large cage is inserted between the bones. Thus, the forces are dispersed across a larger surface area. This is especially important in the cases of weak bone (osteoporosis) and allows the spine to withstand greater loads. This also permits higher rates of bone fusion. Even though it is a minimally invasive procedure, it is still considered a surgery. As with any surgical procedure, there are certain risks you should know about. Careful planning and surgical technique are needed to avoid them. medical complications like blood clots, heart attack, stroke. nerves of the lumbar plexus, which always cross the psoas muscle, may be injured. This may lead to numbness and weakness in the leg. With modern techniques this risk is below 1%, however. Injury to the large vessels that run in front of the spine may occur, leading to life threatening bleeding. Careful planning before the surgery and careful performance of surgery ensure this does not occur. Injury to the internal organs is described in literature. It is avoided by planning and careful surgical technique. How do I know if LLIF is right for me? scoliosis (change in normal curvature of the spine). LLIF is a fusion technique and not everyone requires it. In most cases of pinched nerves, simple decompression without fusion is enough to alleviate pain. extremely poor bone quality (severe osteoporosis). What are the alternatives to LLIF? Even though LLIF is a minimally invasive procedure, it is still a surgery. As with any surgery, it should be considered only if other less invasive options failed. Physical therapy, medications and injections are used as the first line of treatment in most patients. If they do not provide long-standing relief, surgical treatment may be offered. Together with minimally invasive, there is still an option of a traditional open surgery, which involves larger incision, cutting through the muscles and direct exposure of the nerves. In certain situations, open procedure may be more appropriate. What is the spacer made of? The spacer, also called a cage, is typically made of plastic (polyether ether ketone or PEEK) or titanium. In order to achieve fusion, the cage is filled with graft material (cadaver bone or a chemical substance promoting bone growth).